Magneti Marelli has entered 2016 with displaying its advanced technologies and products at two important American events for the automotive sector: the CES (Consumer Electronics Show) in Las Vegas and the NAIAS (North American International Auto Show) in Detroit. 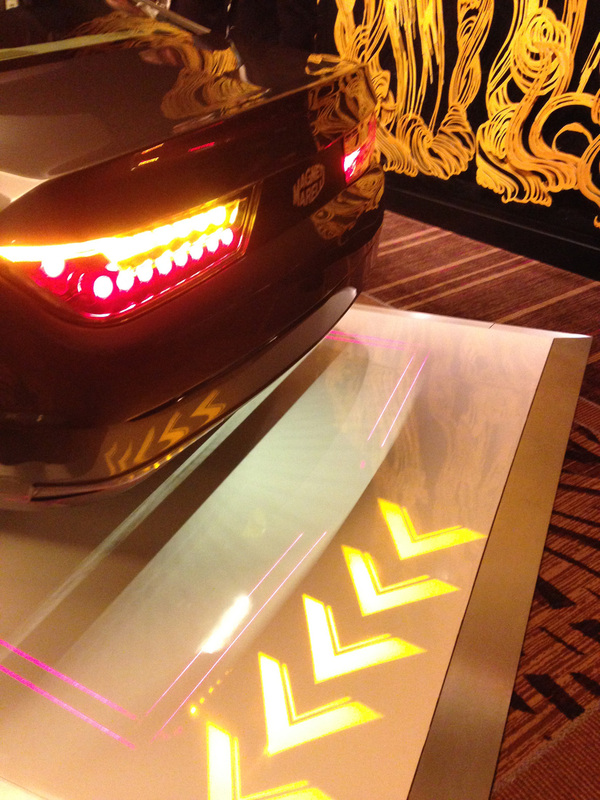 At the CES, two of the main themes for the automotive sector were connectivity and displays. Magneti Marelli reflected these themes at the off-site demo event staged in Las Vegas and also exhibited advanced technologies for lighting, infotainment, telematics and powertrain. Regarding the 2016 North American International Auto Show (NAIAS), scheduled from 11th to 24th January, many of the Magneti Marelli technological solutions are adopted on the new Alfa Romeo Giulia Quadrifoglio, displayed at the show in Detroit. Magneti Marelli is contributing to Alfa Romeo Giulia Quadrifoglio technologies and components, first and foremost within the area of electronic systems: at the forefront is the CDC (Chassis Domain Control) electronic control unit, the "brain" of the car, and the new infotainment system equipped with an 8.8 "black panel" TFT (Thin Film Transistor) display which integrates innovative "optical bonding" technologies designed for perfect display readability. With regard to lighting systems, Magneti Marelli has collaborated with Alfa Romeo to produce the headlamps and rear lamps of the Giulia, distinctive and characteristic design elements of the car. The Giulia Quadrifoglio headlamps are made with Xenon technology equipped with AFS (Adaptive Frontlight System) technology and with a 35W lighting module, a solution that increases the lighting capability by 200% compared to standard halogen headlamps, thus ensuring greater safety when driving. The LED technology is adopted for position lights, DRL (Daytime Running Light), cornering lights and for the indicators. The LED rear tail lights, a synthesis of stylistic and technological excellence, identify the rear of the car uniquely and distinctively, further enhancing the straight and dynamic line of the car. Magneti Marelli also produced the components of the front and rear suspensions, the exhaust system, the pedal board and the plastic parts and, in the electronic systems area, the body computer. The Alfa Romeo 4C Spider showed in Detroit is equipped with many Magneti Marelli technologies: Xenon headlamps and LED rear tail lights, shock absorbers and, in relation to Powertrain, ECU (Electronic Control Unit) and electro-hydraulic actuators of the dual-clutch gearbox. The new Chrysler Pacifica is equipped with Magneti Marelli Automotive Lighting technologies and, in particular, headlamps (halogen and Xenon) and rear lamps (bulb and LED). The second generation Chevrolet Volt hybrid electric vehicle is equipped with Magneti Marelli Automotive Lighting eLight LED headlamps as well as rear lamps. In addition, both halogen and Xenon headlamps as well as LED tail lamps are on the new Chevrolet Camaro. Magneti Marelli lighting technologies are present on the new Audi A4, that is debuting in Detroit with the All-Road version, with LED rear lamps for the Avant version, Bi-Xenon 25 watt headlamps, LED headlamps and Matrix LED headlamps, fitted with individual and independent LEDs that harmonise in real-time light emission intensity depending on the speed and type of route. Magneti Marelli Automotive Lighting LED rear lights are supplied for the new Mercedes-Benz E-Class. With regard to the Electronic Systems, the Porsche 911 Turbo adopts the instrument cluster with the traditional five circular element design that collects all the information useful for the driver with TFT reconfigurable display. At the International Consumer Electronics Show (CES) in Las Vegas, Nevada, for the second year Magneti Marelli had an exclusive off-site demo event staged in Las Vegas to display some selected hi-end technologies. Magneti Marelli showed its solutions for lighting, infotainment, telematics and display, powertrain. Magneti Marelli placed the focus on lighting with the full-LED Matrix Beam module (LED full beam with adaptive system for the guidance of the light beam through the LEDs' selective activation) and on the OLED (organic led) technology rear lamps, that contains red and amber OLEDs which give a homogeneous appearance regardless of perspective. Even when the tail light is off, the OLED elements are extremely elegant and appear to be a silvery mirror. Magneti Marelli also showed signalling lamps with pedestrian notification of turning. Automotive Lighting also made available a special app for iPad to give the opportunity to set up the colours and the luminous intensity of the headlamps and rear lamps. Concerning infotainment, telematics and display, Magneti Marelli presented a selection of the latest generation of instrument panels with AMOLED technology, which are characterised by reduction of power consumption, greater display speed and very sharp colours with a more defined contrast. A devoted exhibition space has been dedicated to AMOLED cluster and AMOLED customizable infotainment and also to a curved AMOLED passenger display with wireless charging, gesture control, and NFC (Near Field Communication ) to customize user interface. In order to give customers the best experience possible, both hands-on displays were set up as well as a seating buck to give customers an in-vehicle experience. Regarding telematics, Magneti Marelli explored all the potential features that allow to enable additional services related to connectivity, presenting the Smart Antenna, an "intelligent" antenna equipped with a modem capable of receiving and transmitting data from the car to operators of external services. Concerning motorsport technologies, Magneti Marelli exhibited cutting-edge solutions such as the Fast Camera, capable of capturing 400 frames per second, which will be introduced this year to improve passive safety in F1 and the advanced Magneti Marelli telemetry system supplied to nearly all the F1 teams. To complement the exhibition, regarding powertrain technologies, Magneti Marelli exhibited the latest solutions in terms of strategic components and systems for hybrid-electric propulsion. Magneti Marelli produces advanced systems and components for the automobile industry. With 89 production units, 12 R&D centres and 26 application centres in 19 countries, more than 38,000 employees and a turnover of 6,5 billion Euro in 2014, the Group supplies all the major carmakers in Europe, North and South America and the Far East. The business areas include Electronic Systems, Lighting, Motor Control, Suspension Systems and Shock Absorbers, Exhaust Systems, Aftermarket Parts & Services, Plastic Components and Modules, and Motorsport. Magneti Marelli is part of FCA.